Along a busy road in Calvert County, Md., a crop is being harvested this week that may surprise some: Tobacco. OWINGS, Md. – Along a busy road in Calvert County, Md., a crop is being harvested this week that may surprise some: Tobacco. “This stuff made southern Maryland what it is,” tobacco farmer S. L. Brady told WTOP. Twelve years after the state of Maryland began paying farmers not to grow tobacco and urging them to switch to other crops, Brady is still going. Brady farms about 40 acres of what’s called Type 31 burley tobacco along Chaneyville Road near Route 4 in Owings. “We used to grow Type 32, which was Maryland-type tobacco, but after the state buyout the poundage got so low, the market dried up, and Philip Morris came along with a contract wanting us to grow this kind so the few of us that were left, this is what we grow,” Brady said. In all, Brady said he grows tobacco, corn, soybeans and wheat on 550 acres in the county — much of which is on rented ground. “Per acre, there’s a lot of work, but there’s a lot of money to be made right there,” he said. Brady called this year’s batch of tobacco “excellent” and said he expects to make about $5,000 an acre before figuring in labor costs. 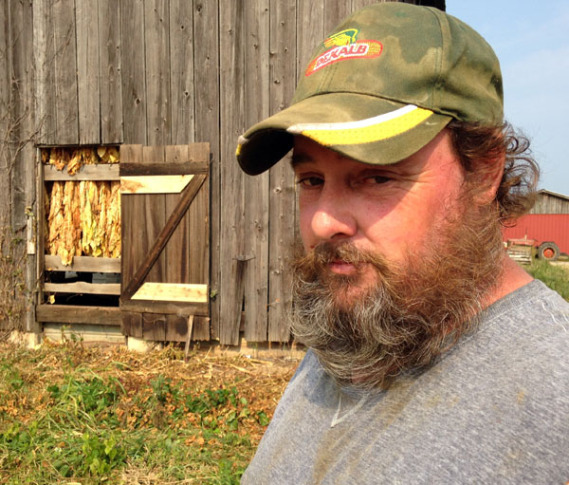 Brady only knows about two other tobacco farmers in Calvert County, but said the crop is more popular in St. Mary’s County — especially among Amish farmers. Brady said he has not ethical problems with growing tobacco. “I smoked up until two years ago. Nobody has held anybody down and made them smoke a cigarette. They went to the store and bought them under their own free will. It’s still a legal crop, legal product. No, I have no quarrel growing it,” he said. Brady, who’s 40, said he plans to continue farming for as long as he can. “I don’t want to do anything else. There are days that I could just walk away from it for the day because nothing goes right, but no. It’s what I want to do, even through the toughest of times, a farmer’s theory is next year will always be better. No matter how bad this one was, next year’s got to be better,” he said. Brady said he hopes his son eventually takes over the family farm which is named High Hopes.